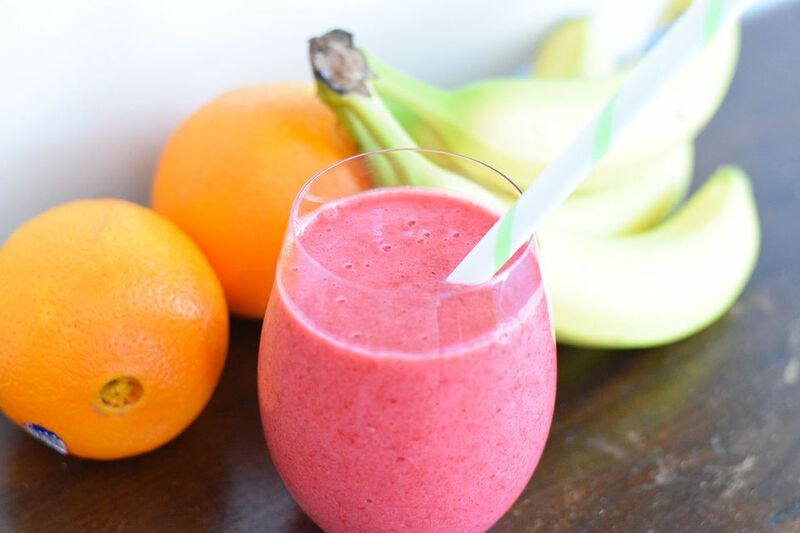 Raspberries, oranges, and pineapples blend together beautifully in this tropical smoothie. Whether it is winter or summer a fresh and tropical tasting smoothie is an excellent way to start your day! We could eat smoothies for every meal! They are packed with fruit, can be full of protein, and are easy to make and to take on the go! Raspberries are full of delicious flavor and are a little more interesting than the basic strawberries. They also create a beautiful color for the smoothie! You can replace the raspberries with blueberries, strawberries, or blackberries if you like! This smoothie uses a nice tropical flavor base of orange pineapple juice. It gives a nice flavor, similar to an ​Orange Julius! You can, of course, use solely pineapple or solely orange juice if you would like! We like to use frozen fruit instead of fresh fruit with ice. We find it gives the smoothie a much better texture! The banana does not have to be frozen. Either way, it helps to thicken the smoothie and make it nice and smooth! Some blenders work better than others for making a smooth smoothie. Usually the ones with blades that run all the way up the blender help to blend the smoothie appropriately. Our blender works very quickly to blend this smoothie. If yours does not handle frozen foods well, it may take a little bit longer. Add the frozen raspberries, frozen pineapple chunks, banana, and orange pineapple juice to a quality blender. If you are adding yogurt, add it at this time as well. It is not necessary to cut up the banana if it is fresh. If it is frozen you may want to cut it in half. It's also helpful if you are freezing bananas yourself to freeze them in chunks! Blend the fruit and juice on high for a minute or so. Make sure the lid is securely placed on top of your blender so you don't have an explosion! Then turn the blender speed down to a lower setting for a minute or so to help create a smooth texture. Pour the smoothie into a large glass or to go container and use a smoothie straw to drink it up! You can probably share this smoothie with someone else, but we can drink this recipe in one sitting!